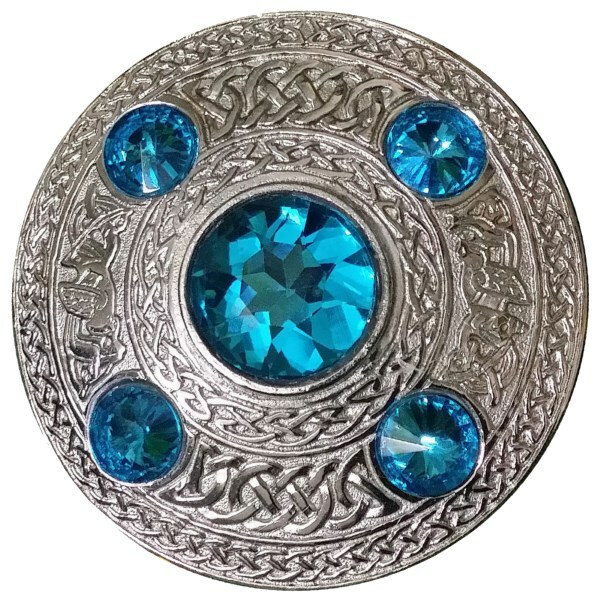 Premium brooch decorated with Celtic knotwork patterns and five blue stones. Ideal for those of Scottish or Galician heritage as blue is the national colour of Scotland and Galicia. + An elegant accompaniment to formal kilt outfits, fly plaids or ladies shawls of any tartan. + Brooch made in brass with a chrome finish and five blue synthetic stones. + Pin at the back to secure it onto your plaid or shawl. + Brooch diameter: 10cm (4 In).